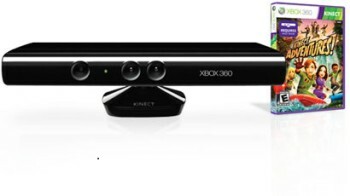 Microsoft: Kinect Shortages "Absolutely Not a Strategy"
Neil Thompson of Microsoft says that despite the popular conspiracy theories, the short supplies of Kinect aren't being managed but simply reflects the fact that it takes time to get the things built and out to store. If Nintendo taught us anything with the Wii, it's that the best way to get people to fight like starving dogs over something is to tell them there's not enough for everyone. So it didn't sound entirely unreasonable when suggestions went around that the Kinect motion control system for the Xbox 360 weren't quite as rare as Microsoft was letting on, and that the software giant was just keeping a tight rein on inventories in order to whip up demand. But Thompson, the general manager of Microsoft's Entertainment and Devices Division for the U.K. and Ireland, says the truth is a whole lot simpler: not even Microsoft can snap its fingers and make this stuff magically appear on shelves. "Anyone who actually works in the business of producing new technology, especially hardware technology, will know that these things are never managed," Thompson told GamesIndustry. "Everyone else loves to think that they're managed, but they will know it's not. It's a function of coming to market with a brand new innovation and you have to scale up." "The choices you always have are: do we launch in November or do we wait until February, March when we could hit some bigger launch numbers but then we miss Christmas. So you're always in this fine balance, saying, 'Well, we want to give people the product as soon as we can, but you can't switch on the manufacturing like water.' It takes time to scale," he continued. "It's absolutely not a strategy, we want to get the product into consumers hands as quickly as we can because we think its exciting, it's innovative. We wanted to do that for Christmas and that's what we've done. We've built a really strong supply and resupply chain over the coming weeks." I have no idea what goes on behind closed doors but as someone with a certain degree of insight into the tenth circle of Hell known as retail, I can say that Kinect supplies aren't just tight, they're painful. If Microsoft is faking it, it's doing the most perfect job imaginable of making it appear that they really just don't have any product to ship. When customers are being turned away without even a hint of hope for big shipments in the offing, that's not sharp marketing - that's just damaging.